There were four stars in that subject line, not three, and that’s because the word I’ve disguised is cynic. Now you might not think that cynic is a dirty word – I disagree. And worse still, it can cost you a fortune. The cynic: Hasn’t read the guide, won’t read the guide. The optimist/open mind: Reads the guide because it’s free. It may only cover stuff he or she already knows, it may ultimately be of no value to them. Then again it may also completely transform their betting and make them much more profitable. Either way it certainly hasn’t cost them anything to find out. Presumably, whenever he walks past a stand of free copies of The Metro newspaper, or the Evening Standard (if in London), he shakes his head in disgust and keeps on walking. The cynic: Either continues to place uneducated ‘mug’ bets and continues to lose, or doesn’t bet at all (but no doubt plays the lottery religiously every week). The optimist/open mind: Does the tiniest bit of research. 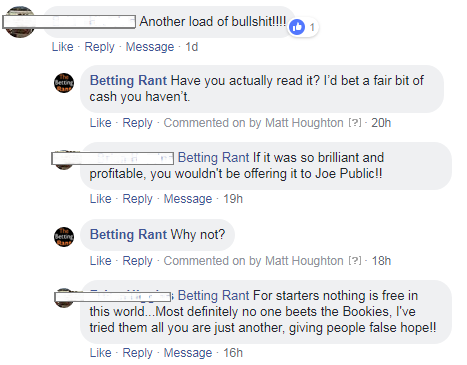 Discovers that there are high profile figures that absolutely do beat the bookies (such as Tony Bloom) and also discovers that there is an actual online movement, so big is the problem with bookmakers closing down winning bettors.Realises that it is possible to make money from betting and perhaps goes on to do exactly that. That email was in response to a ‘less than half price’ promotion for our NFL service. The cynic: Turns their nose up at the offer and goes about their day. The optimist/open mind: Asks why it’s discounted. Discovers that it’s because we’re halfway through the NFL season and so it’s been decided that people will be offered the chance to get involved at a low price as a trial run for the last couple of months. If they don’t like the service it’s only cost a few quid and, if they do, they’ve got a bargain and they can renew at the full price for the 2019/20 season. The above isn’t to say that everything we offer is magnificent or that you should always take action whenever I offer something up to you. Examples I have personally encountered include energy drinks, bags of sweets and even loaves of bread. The optimist/open minded person would get a free loaf of bread. Sure, the Nations League may not be the World Cup, but it is a tournament that pits the best nations in Europe against each other and that those nations were undoubtedly taking seriously. The cynic doesn’t care about this, the cynic blusters something about “glorified friendlies”, claims “we’ll probably get stuffed in the semis anyway” and goes back to their day job, scowling at customers who dare to approach their checkout. The optimist/open minded person allows a little bit of joy to seep into their heart and goes about their Monday with a smile on their face. Cynic or optimist? I know which one I’d rather be.